Email technology is constantly evolving – and we’re so excited about where it’s going. Are you evolving with it? Read our blog post on this year’s 4 leading email tech trends to find out. We keep saying it: personalisation and dynamic content is the key to higher engagement, real communication, and mutually beneficial client relationships. And, according to Litmus, it’s top on the list for marketers too. What are they? At Everlytic, personalisation and dynamic content are tools that enable you to customise even bulk emails using the data you collect on each subscriber. Personalisation enables you to speak directly to each individual subscriber by using subscriber data to customise things like the name you use in the greeting and other information (ID number / location etc.) within the mail. Dynamic content usually works with list segmentation. First, you break your database up into segments of smaller target audiences (like gender, location, engagement, or interests) and then you send entire sections of content to specific audiences. In Everlytic, you can even send dynamic content based on conditions, like if a subscriber’s read or clicked on a link in a previous mail. Read more on our Automation page. Interactive emails continue to trend this year – and we’ll vouch for it. More and more of our own email technology is being developed for interactive email experiences that enable typically web-based actions within an email without clicking through to a website. Live content allows you to pull images and information from a remote source when the mail is opened – it isn’t embedded in the mail itself. This ensures that the content a reader sees is current and up-to-date for people who either don’t read their emails immediately, or who open it more than once. Newsflash! Microsoft Office 365’s version of Outlook now supports GIF animation. This is HUGE, because more and more people can now see video-like content directly in their emails – and that grabs attention. The kind of attention that increases opens and clicks. Want to use more GIFs in your emails? Read our blog post on How to Create Email GIFs. Even video itself is supported by some email clients (like Apple Mail and Outlook for Mac). It’s coming to others soon too. 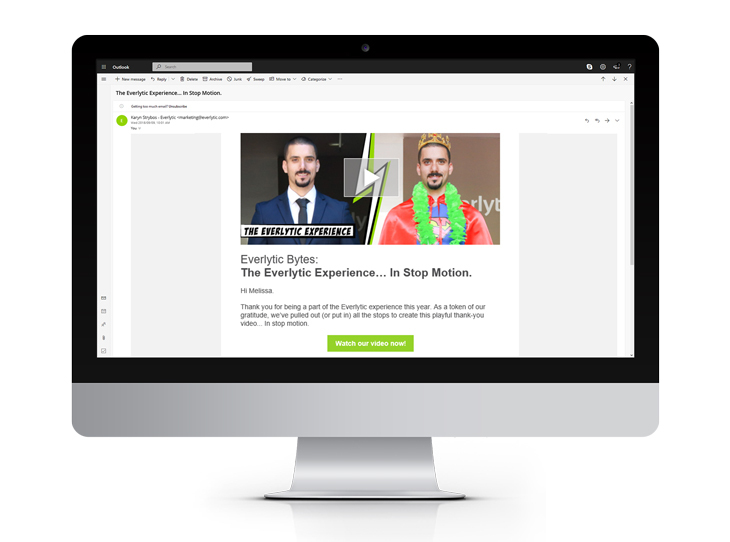 In the meantime, Everlytic has just launched a new feature that allows you to send a preview image of a YouTube or Vimeo video that links to the URL of the video. Avoid going overboard with these though. Too many moving parts in an email can be data heavy and visually overwhelming. So, stick to one GIF or video per email. It may seem like a contrast seeing simplified emails on this list after having read about such complex email technology in the first few trends, but when used well, this is exactly what these technologies aim to achieve – a simpler experience for the user. Why is this? Because people don’t read. Not properly, anyway. In our content-saturated online world, most people just scan content. And in email, where communication is largely text-based and mobile, this means finding smart ways of sharing information in simpler, easier-to-consume ways. Email is just one of multiple effective communication and marketing channels. And your customers are probably on all of them. Intelligent campaigns that integrate with technologies like Google ads, SMS marketing, social media, landing pages, and your website take customers on a journey that engages them without overburdening them on one platform. Feeling more prepared for the email-tech wave that is 2019? We are. So, if this blog post just inspired you to do more with your email marketing, get in touch.